It would be great if you could get beautiful pictures, but wouldn’t it be amazing if you could get it while you and the energetic kids had fun on your Gatlinburg Vacation? Hi, I'm Alisha. Grab a cup of coffee and take a look around. You want an easy, fun photography experience? You're in the right place! All of my packages are all-inclusive that cover absolutely everything from your session fee to your digital images, so there's no extra charges to travel to beautiful Smoky Mountain locations or enjoy your pictures your way. Want to send them to your Great-Aunt Junie in Nebraska? Share them on social media? Order unrestricted prints? No problem! Are you a local looking for a fabulous Knoxville Photographer? I’m your girl. We’ll have a grand time from planning, straight to freaking amazing pictures on your wall. You're a busy person, so I'll make this as effortless as possible. We'll work together to create a fun session, with gorgeous images. I know your life is overloaded and hectic ( there's a probably a toddler who needs your attention right NOW), so let me make planning portrait session a breeze. As a photographer in Gatlinburg TN I frequently traveling to the Smoky Mountains and Pigeon Forge, TN, where I am authorized to perform sessions inside the national park. 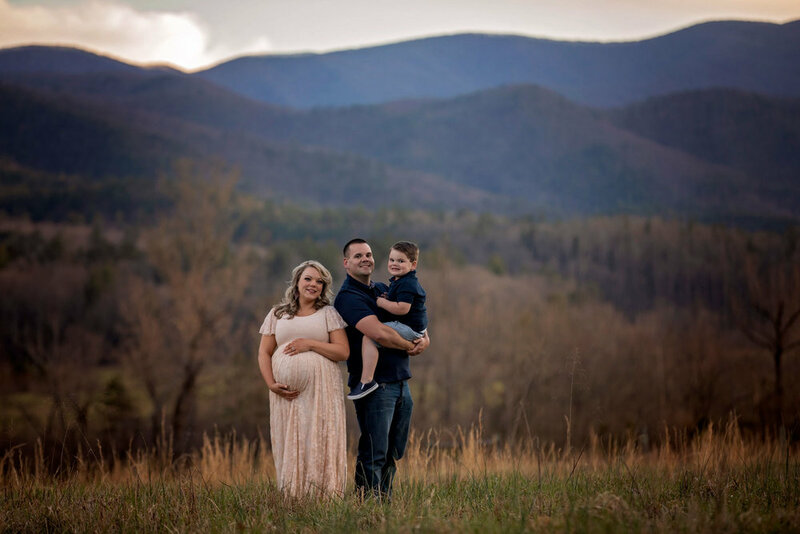 My specialties are maternity photography, newborn baby photography, and family photography and professional head shots in the greater Knoxville, Tennessee and Gatlinburg areas. You can expect a personal, custom, and enjoyable experience. Your memories are of the utmost importance to me; Photographs are timeless and will grace you and your family's walls and memory books for generations to come. You should have the BEST quality photos at affordable rates. My number one goal as a photographer is to give quality images to each and every one of her clients. I believe that giving top quality work as a professional photographer should be the top priority of all Knoxville photographers. By choosing me as your photographer, you are putting yourself in great hands to handle all of your portrait needs from sweet pregnancy moments to corporate head shots. Be sure to book your session in advance, especially for maternity and newborn portraits . Pigeon Forge and Gatlinburg photographers are often booked up several months in advance during the peak travel months. Newborn slots are limited due to their unpredictable nature and short window of time for the best portraits. Your pregnancy and newborn baby should be documented beautifully by someone who specializing in capturing those moments for your family. I sometimes have cancellations, so feel free to check with her for last minute maternity, newborn, family, or a corporate headshots opening. Have you ever stared at a friend's family portrait and said "Oh... how cute" but thought to yourself "Oh no..."? Hi, I am Alisha and I specialize in creating amazing, canvas-worthy pictures of your family that will make you say "Oh, yeah!" If you have been searching for a photographer that gets "you", your love of Starbucks, Grey's Anatomy, Pottery Barn and the Gatlinburg in the heart of the Smoky Mountains then- Welcome home. I'm a mom and loving wife who was so tired of struggling to find a photographer who understood my need for phenomenal pictures and a stress-free experience - that I became that photographer. 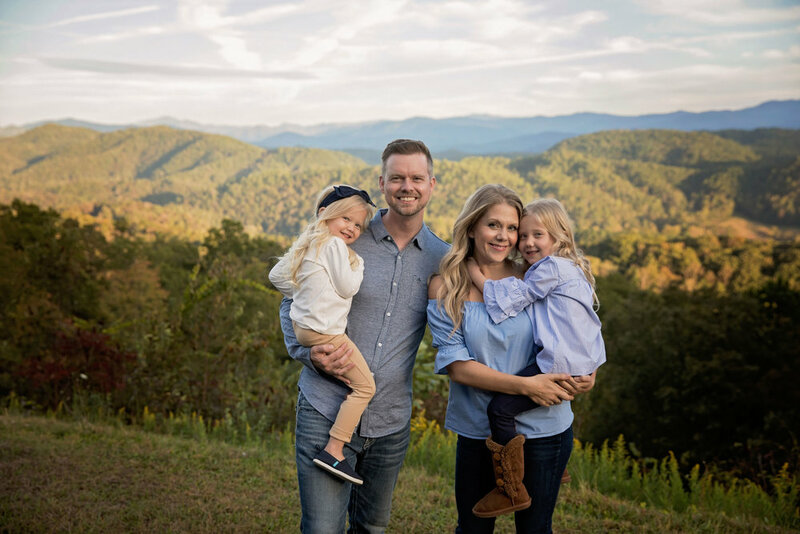 Based in Knoxville and Gatlinburg Tennessee I started working with family, maternity, and newborn clients on their portrait sessions and noticed an utter lack of "easy". They were used to hidden fees, minimum orders, and family pictures being a day worthy hair pulling and hand wringing. These problems, my respect for my clients, and love for creating beautiful images led me here. Now, I am able to provide my all-inlcusive packages, custom sessions and stress-free experience, giving you the results you deserve. In my spare time, I enjoy lattes, Cades Cove and capturing our life through my lens— with my two daughter, and dear husband. If you are seeking jaw-dropping, make-the-neighbors-jealous portraits, a fun session and someone to plan to make your pictures perfect in your day, then I believe this is the start of something special.